Gold dipped below $1,600 last week, falling to a six-month low, much to the chagrin of gold investors. I find the timing of the correction peculiar, given the G20 Finance Ministers Meeting taking place over the weekend. There's been a growing debate over Japan's move to devalue its currency to stimulate growth, with reaction from the G-7 leaders stating that "domestic economic policies must not be used to target currencies," reports Reuters. 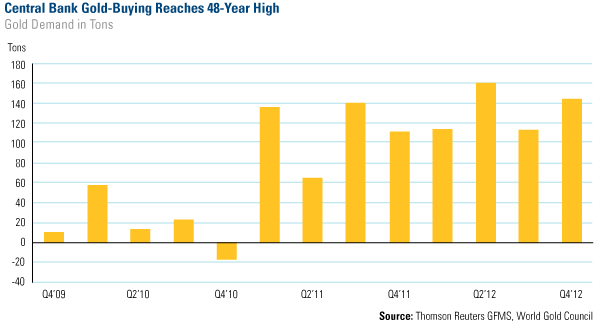 The main reason the mainstream media gave for the correction in the yellow metal is hedge funds' selling of gold late last year. According to quarterly filings, Hedge Fund Manager George Soros sold half of his holdings in the SPDR Gold Trust ETF (GLD) in the fourth quarter of 2012. Bloomberg attributed the sell as a move that may "bolster speculation that gold's 12-year bull-run is coming to the end." However, Soros may have liquidated his gold holdings because he identified a significant short-term opportunity in the currency markets. I have said many times that government policies are precursors to change, and late last year, Japan's new leader, Prime Minister Shinzō Abe, openly indicated his intention to drive down the currency to make the economy more competitive and increase inflation. 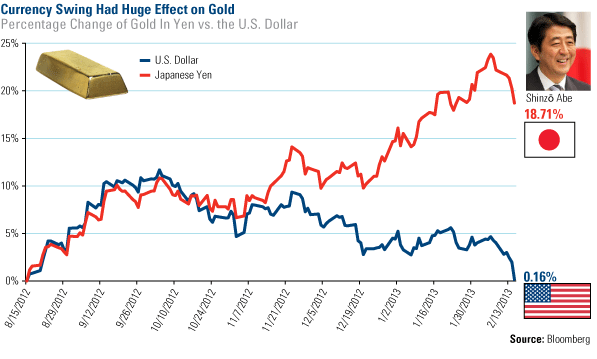 As a result of Japan's policy changes, the yen weakened, driving up the price of gold in Japan's local currency. Take a look at the comparison of gold's return in different currencies. The chart below compares the percentage change of gold in the Japanese yen to the metal's percentage change in U.S. dollar terms over the last six months. From the middle of August 2012 until about November, gold prices in both currencies closely followed each other. George Soros seemed to anticipate the effect that Japan's government policies would likely have on the velocity of money. This turned out to be a brilliant move, as "wagering against the yen has emerged as the hottest trade on Wall Street over the past three months," says the Wall Street Journal. The newspaper reported that Soros gained "almost $1 billion on the trade since November," during a time the yen declined nearly 20 percent in four months. This isn't his first big win in foreign markets. In 1992, based on British government policy changes, Soros shorted British pounds and bought German marks, earning $1.8 billion for his fund. I discussed the potential motivation behind Soros' trade with CNBC's Simon Hobbs on Friday. I explained how gold's correction was reaching an extreme, indicating a potential buying opportunity. 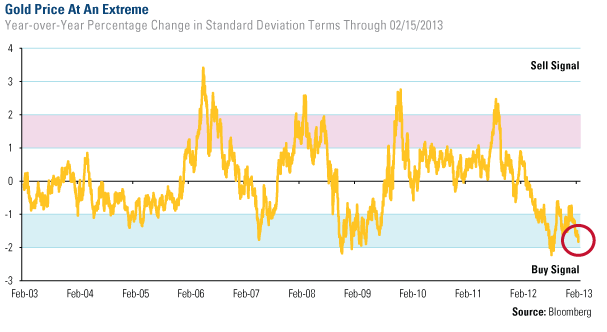 You can see on our oscillator model how gold has dropped nearly 2 standard deviations on a year-over-year basis. An event like this has happened only about 2 percent of the time over the last 10 years. Following these extreme lows, gold has historically increased as much as 15 percent over the next year. During short-term gold corrections, it's much more important to focus on the facts, including the fact that gold is increasingly viewed as a currency. Rather than buying real estate, lumber or diamonds, central banks around the world are buying gold. According to the World Gold Council (WGC), over 2012, central bank demand totaled 534 tons, a level we have not seen in nearly 50 years. Another fact about gold is the persistence of the Love Trade. As you can see below, jewelry demand declined slightly, about 3 percent in 2012, and more than half of this demand came from India and China, the countries with a cultural affinity toward gold. India's gold purchases declined 12 percent due to an import tax and a weak rupee. However, even though the gold price experienced a significant increase in local currency, India's demand is "all the more remarkable and serves to emphasise the importance of gold to Indian consumers," says the WGC. In 2013, the WGC expects both markets to remain strong, forecasting growth rates of about 10 to 15 percent. I believe as GDPs in Chindia rise, so will their gold demand. And as long as the precious metal is attractive to both the fear trade and the love trade, hold tight to gold, with a 5 to 10 percent weighting in gold and gold stocks, and rebalancing annually. >>Don't miss Our 2013 Guide to Investing in Gold. I too agree with you. Facts works well in case of gold investment. Just look at central bank buying activity over the past ten years. Depending on your data source(s), its seems to me they were selling when gold was at its historic lows of $250-$300/ounce. Now they are net buyers when gold is near historic highs. U.S. BANKERS are late to the game to be sure and their buying activity as a group (cartel) may indicate a market top rather than a low or "buy signal". There are a multitude of opinions and specualtors in any marketplace, especially in the commodity markets such as gold. Contrary investing has its rewards. Don't assume central bankers know exactly what they are doing either. Many are deceptive and (head)fakes, as well. Recent report reaching me tells a vivid story why price of gold is down. down the price of Gold in order to return Gold to Germany. Oh stop with this Great County thing! There have been many great countries in centuries gone by; England being one of them considering it’s a “small” island compared to the US. Obama answers to a much higher hierarchy (much like Boy Bush did and many before him); hence Obama is not the only person who wants to see this country go down the toilet. It always makes me laugh at how people think this country as so great and the world would/could not survive if America were not at the helm, but the world WILL survive – just fine in fact! It will never be as great as the British Empire (where Churchill pretty much gave the BE to the US on a plate after WWII); Roman Empire or many other Empires for its time. I think you will find of all the Empires worth talking about, the US Imperialism is one of the shortest on record! You can also thank the (Mayflower) British and others that followed for laying down the foundations of America we know today, who in return can thank the Native Indians (NI) for saving their asses during the cold, heartless and long winters; and who taught them how to live off the land. Then the Brits thanked the NI’s by slaughtering them in almost oblivion. This kind of brutality continues today in the Middle East and parts of Africa with the West backing the (supposed) dictatorships of these countries behind ulterior motives that benefit the western hierarchy which America (UK, Israel and France) have played a huge part in this for decades. So if you think ulterior motives such as this makes American a great country, you keep on believing the lies! Silver may be better as "the poor man's gold". It's a much smaller market, and even less commonly held than gold. But with industrial applications from missile components to antibiotics, it's economically sensitive as well. If the economy goes in the tank, silver will also, and gold price will be better preserved. >> If the economy goes in the tank, silver will also << I'm not sure that this will be the case. Economys "tank" in different ways. The largest commercial consumers of silver are the chemical, pharmaceutical, and electronics industries. These industries will not collapse, though the focus of their resources may shift. Hence, though silver may see some short-term ups and downs, it's long-term value as an investment will ride the storm. I don't think we will ever see silver back to $5 to $10 /oz. in our lifetimes.. But even if demand for silver does track to the low side as an industrial commodity, there is still it's perceived intrinsic value as a precious metal. If I invest in silver with a thought to "buy low and sell high", then of course I will suffer loss if silver drops below what I paid for it. But if I am buying it as a hedge against hyper-inflation, then I'm not worried about taking a modest loss now and then. I'm worried about finding that I can no longer do business with gov't-issued currency. In this situation, silver is more convenient than gold. Currently, the silver content of ten silver dimes or four silver quarters is about $25. Compare that to the value of a 1/10 oz. gold coin, which is worth well over $150. Pre-1965 silver coinage is in all but infinite supply, and I expect your local grocer or gas station owner will gladly accept it at a reasonable exchange rate, when Obama's Treasury Dept. starts cranking out worthless paper currency. Great post. Get the desired knowledge about the gold current ratings and karat values before selling it.